Searching For the Road Delineators ? Whats Is Road Delineators ? The Light Reflecting Devices which are mounted along the side of roadway in primarily series to guide traffic through alignment changes are called Road Delineators. These devices can be used to supplement other signs and are designed to "delineate" traffic or guide traffic into a specific lane. In the Market, You can find the different height of Road Delineators with their different colors choices. Road Delineators should be mounted 4 feet above the roadway and placed 2 to 8 feet outside the shoulder or road edge. There are two types designs of Road Delineators 1. Tubular Road Delineators 2. Flat Panel Road Delineators. Mostly all delineators are designed to withstand vehicular impacts. 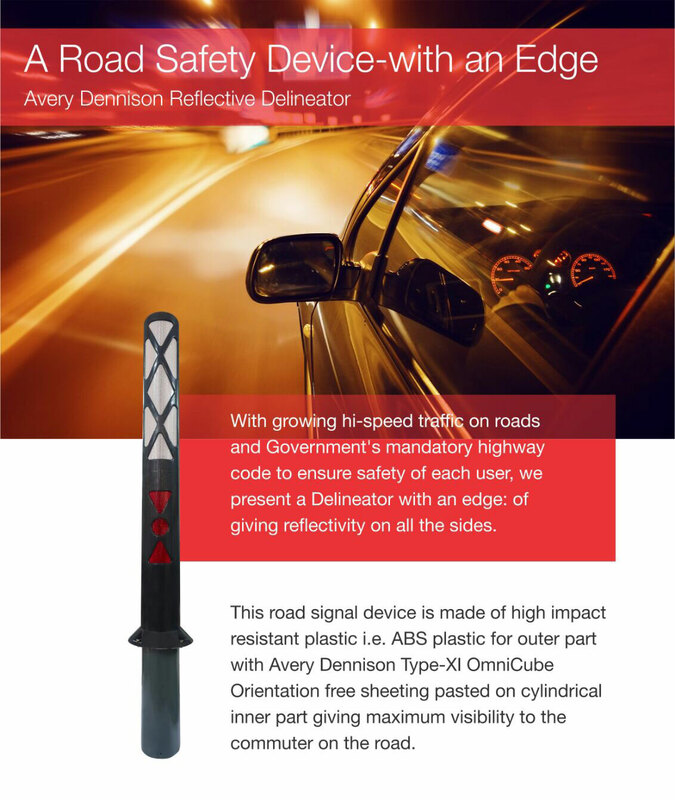 All categories of delineator come with reflective taping. The reflective tapes may be installed on one side or both sides. Distance from the road edge and between devices should remain constant unless existing obstructions or road features prohibit this placement. Several road delineators should always be visible simultaneously to motorists. Trial observations should be made at night to determine effectiveness of delineators after installation. Peoples Know that Road Delineators help as a guide pedestrains and motorists alike around construction areas or even accidents. Using a delineator is an effective way to safely redirect traffic away from potentially harmful situations. At ADSTAR, we offer a best quality of road delineators to suit all the possible situations your workers encounter on a daily basis. We also offer a variety of Road reflectors or Road Studs that help guide motorists towards safety in dark conditions. In our huge list of all clients, Avery Dennisson is our major client who's working with us from many years. we are the major road delineators manufacturers and suppliers in India and other countries. so you can contact with us by calling or Email at anytime regarding Road Delineators , Road Studs, Road Reflectors.